The engine is what produces the power needed to move your car to get you to where you're trying to go. Even minor issues under the hood can grown into some significant engine issues if they are not quickly taken care of. So be sure to pay attention to any signs of engine trouble, such as the following six, as you'll want to get to a repair shop ASAP if you notice any of them. One of the most common causes of engine failure is a lack of oil in the engine. This will result in excessive wear and tear due to improper lubrication. Should you spot black or dark brown spots under your vehicle, make an appointment for further diagnostics. When you have the oil changed in your car make sure the technicians take a peek at the old oil. If metal shavings are found it is probable there is poor lubrication occurring inside the engine. If this goes unaddressed the motor could eventually seize. An increase in exhaust smoke is a clear sign of internal engine trouble. Based on the color of the smoke you can generally get a sense of what is wrong. Black smoke indicates too much gas is being burned, white smoke is a sign of an internal coolant leak and blue smoke is a symptom of burning oil. 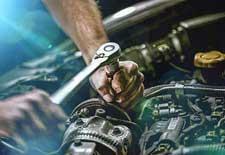 A knocking sound that rises and falls in repetition with the engine RPMs is a common sign of failing engine bearings. These bearings support the motion of the moving engine parts and should they fail the engine could come to an abrupt halt, resulting in massive engine damage. If your car is becoming hard to start, suffers from a rough idle or stalling or has been getting significantly less miles per gallon then it'd be wise to visit the auto shop. These types of issues are often caused my small problems, like corroded spark plugs, which are affordable to replace. One sign of engine trouble that will stare you right in the face is the check engine light. While it is often feared it generally represents relatively small issues, at least to begin with. To prevent minor troubles, such as a malfunctioning oxygen sensor, from growing into big problems, like a failed catalytic converter, head to the shop for check engine light diagnostics immediately. Don't ignore signs of engine trouble, as the problem will only get worse. If you believe your car needs engine repair in Boise head to Red Line Transmissions. Our full service auto repair shop is staffed by expert techs with access to the latest diagnostic and repair equipment, ensuring fast and accurate service. Give us a call at (208) 314-2216 to schedule an appointment for superior auto repair in Boise today.